Libertyville, IL, April 12, 2016 — /EPR ACCOUNTING NEWS/ — Schonfeld & Associates offers a valuable addition to business reference resources in IRS Corporate Financial Ratios, a unique reference with information gleaned from over 95 thousand corporate tax returns. As a reliable information source, it can be used in many ways from gathering competitive intelligence to evaluating tax returns before filing. It is an ideal reference for CPAs, controllers, bankers, CFOs, tax lawyers, financial analysts, investment advisors and corporate planners. The newly available 31st edition of the report contains just released information from corporate tax returns filed for the 2013 fiscal year. Of all U.S. corporations, the greatest number, 15% of the total, fell into the Professional Services sector. Within that sector, over 65% of the firms were profitable. Over all sectors, over 60% were profitable. All sectors except for real estate and holding companies had a majority of profitable firms. One major accounting firm has used IRS Corporate Financial Ratios to develop a report to accompany delivery of the corporate tax return, which both enhances service to existing clients and can serve as the basis for additional assignments. Even the IRS, as well as some state agencies, uses it for tax and compensation audits. It may also be used in forensic accounting such as for estimating damage claims in lawsuits. IRS Corporate Financial Ratios is a statistical reference containing 76 key financial ratios for companies in each of over 250 NAICS industries. Based on actual tax records of the Internal Revenue Service, it is a comprehensive and authoritative source of corporate tax information and financial ratios. It is an essential book for anyone who wants to analyze tax returns in a serious way, do competitive research or perform self-audits. IRS Corporate Financial Ratios provides clear benchmarks of financial performance. Included are: Turnover Ratios, such as inventory sales turns and inventory cost turns, Expense Percentages, Employment Percentages, such as officer compensation to PBIT, Profitability Percentages, such as gross, operating and net margin, Liquidity Ratios, such as days receivable and days payable and many more financial measures of performance. 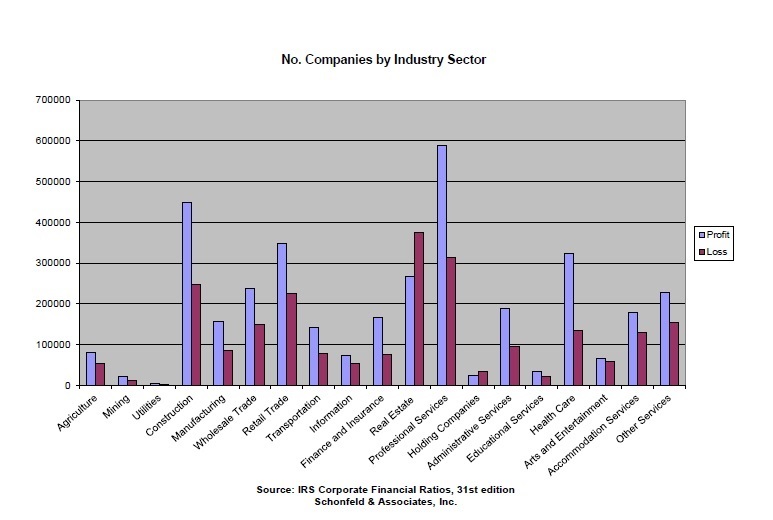 For each industry, ratios are shown for the overall industry and for companies in four asset size classes. Within each size class, a complete set of 76 ratios is shown for both profitable companies and companies with losses. The format of the book allows comparisons so that ratios which distinguish profitable firms are immediately visible, a real aid to improving financial management. IRS Corporate Financial Ratios is useful in developing budgets and financial plans. Besides being available in printed or PDF format, users can purchase an Excel template, IRS-CALC, with all the report data included. For any firm, tax return information can be entered, ratios calculated automatically and compared to industry norms and printed in reports. IRS Corporate Financial Ratios includes an extensive introduction containing definitions with an explanation of how to calculate and interpret each financial ratio. A complete industry index is provided. IRS Corporate Financial Ratios is published annually by Schonfeld & Associates based on the most current corporate tax return information available from the U.S. Internal Revenue Service. It is a unique, useful reference that belongs on the bookshelf or in the computer of every financial manager. The current 31st edition is available for $225 directly from Schonfeld & Associates, Inc., 1931 Lynn Circle, Libertyville, IL 60048. IRS-CALC, the Excel spreadsheet template, is available for an additional $100. Call for more information or to place an order at 800-205-0030. Visit the Corporate Financial Ratios area of expertise on the corporate web site where a secure order can be placed for immediate download or hard copy delivery.